When it came to Asian noodles, I used to find anything other than instant ramen intimidating. After all, there were strange sauces, herbs I wasn’t familiar with, and noodles made from rice. Rice! 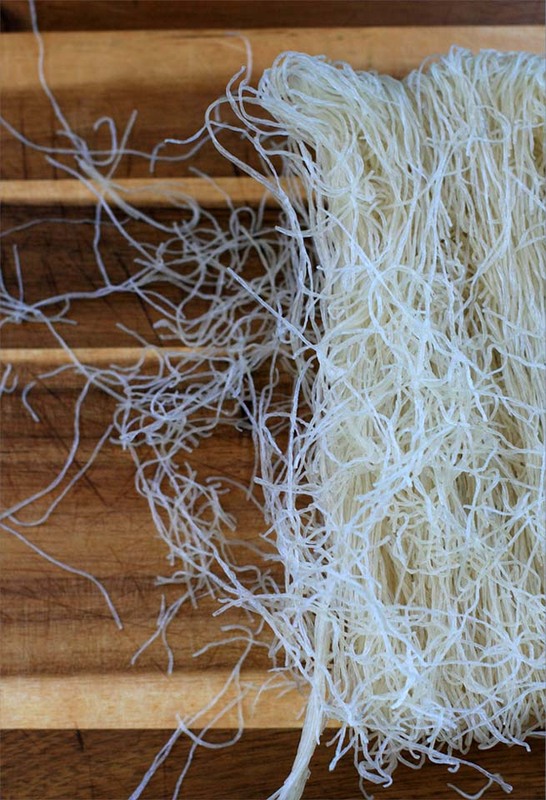 And instructions for these rice noodles called for soaking them in hot water off of the heating element. Say what? Then I went to Vietnam and fell in love with bun cha Hanoi. Suddenly I was a lot more willing to experiment with Asian noodles dishes and seek out unfamiliar ingredients. Turns out I made a lot of fuss over nothing. Now that I’ve gone gluten-free, rice noodles are a way of life. Those funny herbs? I guess I’ve figured them out. And the sauces? They’re a snap to make. This is one of those infinitely adaptable meals that’s surprisingly quick to make if you’ve got some staples in the fridge (tip: my local Vietnamese market sells nuoc cham as well as pickled carrots and daikon so it’s worth checking your local Asian market if you’re short on time). 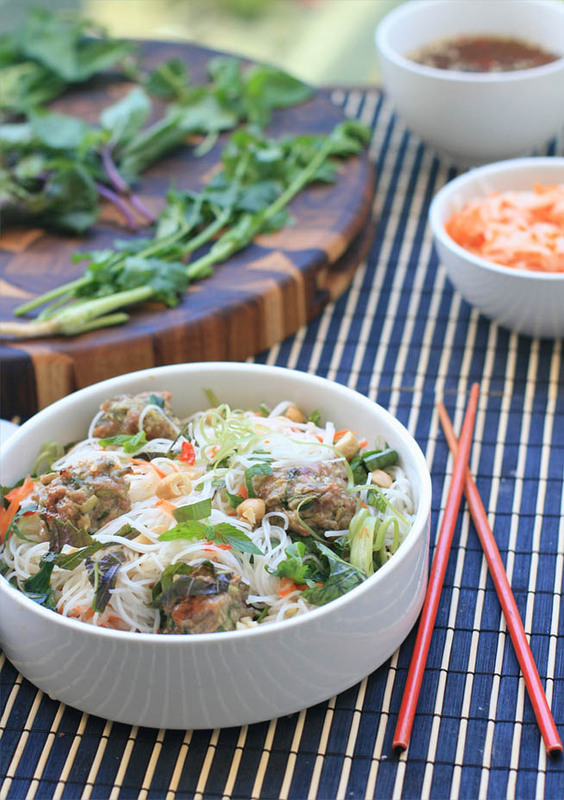 Here I combined the noodles with pork meatballs, but it would also be great with lemongrass shrimp or even standard shredded rotisserie chicken as the protein. 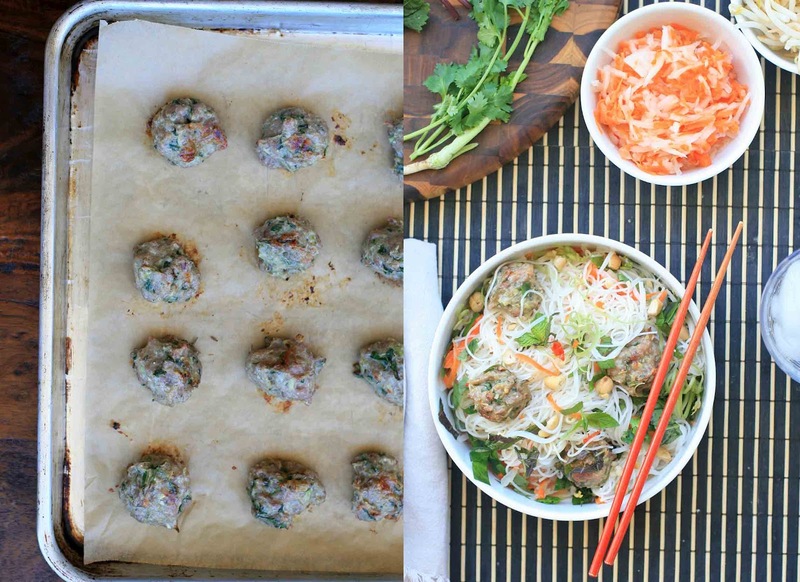 And don’t worry if you are out of mung bean sprouts, cucumber, or even one or two of the herbs. Just make sure you’ve got some noodles, a healthy dose of crunchy vegetables, a handful of herbs, a protein and some nuoc cham and you’ll be all set. Bring a large pot of water to a boil. Remove from heat and add the noddles. Stir quickly to separate noodles. Let stand for 10 minutes. Drain and rinse in cold water. Divide the noodles into four bowls. Evenly divide the carrot and daikon pickles, mung bean sprouts, cucumber, herbs, and meatballs. Top with a sprinkle of peanuts. 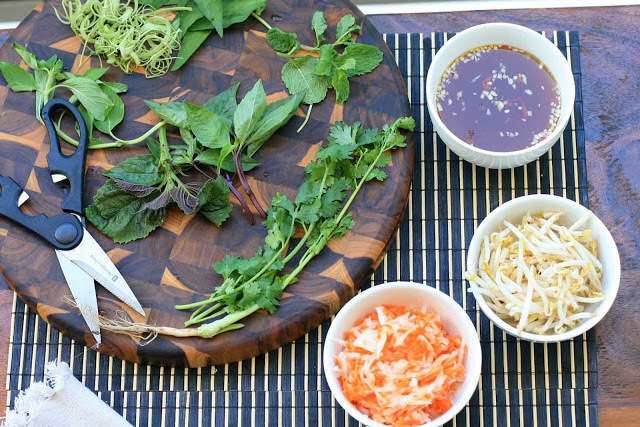 Allow individuals to ladle on desired amount of nuoc cham.